My kids are the reason that I had to tell my story. My youngest son revealed that he knows that mu favorite color really is grey, despite my many proclamations otherwise. Grey linen for our beds just easily matches practically everything, grey sneakers are mush easier to keep clean, sporty heather grey tees and athletic wear are classics, and of course my grey wool coat is warm and functional- I only have a grey pocket book because I have a grey coat, that doesn't even factor into the equation. That's not my story. Here's why it's important to know what's your color story. Thank you to Moll Anderson and the promotional team from Change Your Home Change Your Life with Color for sponsoring this informative advertorial content with an Advanced Reader Copy of the book. Here's my story, as a child, I was never encouraged to really know myself. That sounds strange to say, however, I never had a favorite meal, place, song, game, outfit, or even color. I just accepted things as they were, love it or leave it. It wasn't until I was an adult that I discovered favorites, my favorites. The aroma of gardenia is magical, the beach is my happy place, macaroni and cheese is my comfort food, and I adore the color yellow, that's my color story. Grey, grey, go away. "Color psychology is the study of hues as a determinant of human behavior." as defined by Wikipedia. 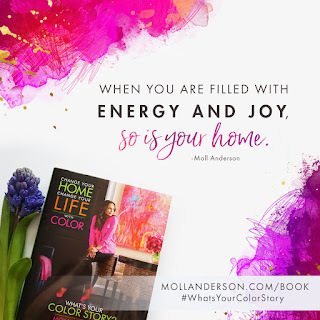 Moll Anderson, author of the vibrant and revealing new book, Change Your Home, Change Your Life with Color inspires the invitation of color into our homes and our lives through the exploration of "your own personal connection to color." Abandoning the safety of neutrality within my personal space, pops of color now enliven my days. The small and bold touches of whimsy now bring joy to a once blank canvas. "Whether you realize it or not, color rules—rules your home, rules your emotions, rules your life. Your emotional response to color is based on your experiences and memories, and like any memory, color can evoke happy feelings—or not-so-happy ones. But what is your color story? Which colors are meaningful and inspiring to you? And how do you know? That’s where life stylist and color aficionado Moll Anderson can help. As an interior designer, Moll saw first-hand the difference color made in her clients’ lives. It went far beyond designing a “pretty” space—the effects were transformative. As Moll explored color theory in her own life, she realized how important— and powerful—color really is. 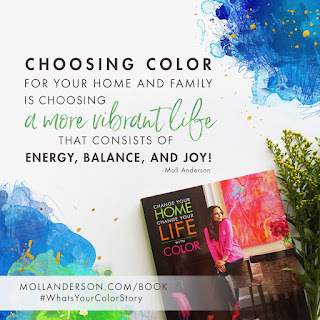 This knowledge is so life-changing that Moll wants to inspire you, the reader, to take possession of the transformative power of color in your life. So, why don’t you take this journey to explore your color story as Moll guides you, and shows you, just how colorful your world can be. You’ve got nothing to lose. Get to know #WhatsYourColorStory today for more details and purchasing information. As the owner of this blog,niecyisms and nestlings, I am compensated to provide my opinion on products, services, websites and various other topics. This blog may contain affiliate links. Even though, as the writer/owner of this blog receiving compensation for posts or advertisements, I will always give my honest opinions, findings, beliefs or experiences on those topics or products. This blog abides by word of mouth marketing standards. I believe in the honesty of relationship, opinion and identity. The views and opinions expressed on this blog are purely my own. Any product claim, statistic, quote or other representation about a product or service should be verified with the manufacturer, provider or party in question.